Hi Earl. Just wanted to have the first post :-)). Carry on. You’re such a turd Fridge. Well that didn’t take long to head off the rails. Can one of you send an email to the address so I know it is working? I’m in. Email on the way. Well that didn t take long to head off the rails. I missed the last beer and marking tool swap, (although I followed them daily), and miss being in swaps! My Wife has health issues but it’s a long time until March 12th. I just may have time to make a nice surprise for someone so I’m in. The return of jeffswildwood! Ohhhh this should be interesting. I missed the last beer and marking tool swap, (although I followed them daily), and miss being in swaps! My Wife has health issues but it s a long time until March 12th. I just may have time to make a nice surprise for someone so I m in. The return of jeffswildwood! E mail sent! Thanks for the welcome home guys. Ken, I too have shed those “no swap for me” tears. Rich, I planed some of that box elder, It still hasn’t told me what it wants to be yet. ;-). Box is in the plans! Some may turn up in the swap! Someone tell Fridge that Kenny needs a hug. If Fridge can’t help, I think I saw Olaf in Kenny’s front yard. I’m sure you will come around to the realization that you can’t sit this one out. No pressure. You will have to come up with a better excuse though. I just may have time to make a nice surprise for someone so I m in. The return of jeffswildwood! Good to have you back, buddy! With you and Earl in, I’m going to need to step up my game some more. Got three ideas already. Now I just need to learn the skills to build one of them! It’s been a while for me as well. I’m gonna follow for now and see if life is slowing down (or I am speeding up?) before I commit. I get on box builders and wood turners group. I’m in! Been watching the swaps loosely for the last two years and it’s time to participate. Will any sort of theme be decided on, or is it really anything from a jewelry box to a six-pack-holder to a sweet marking gage? John – Anything you want to tackle. Candy – we’d be thrilled to have you join in. Maybe Earl should clarify one way or the other in the OP?? LOL, nevermind, Earl spoke as I typed ;-) Jewelry box it is! I’m on a few of those too Jeff!! Kenny – make sure you don’t accidently put the family jewels in the box. John, if you’re in for reals, you probably need to email Earl, since he hasn’t added you yet. I m in! Been watching the swaps loosely for the last two years and it s time to participate. 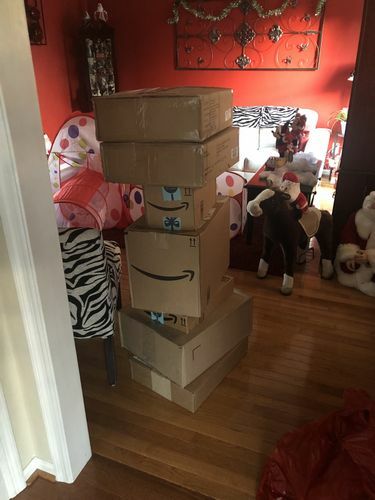 I’m fairly certain my wife keeps Amazon in business from Thanksgiving to Christmas. Here is today’s haul. Guess I can’t keep putting of my procrastination. There’s a shoe in there for size reference. Hey Earl, Count me in. There s a shoe in there for size reference. I think shipping on a kayak might be a little steep for a swap, but it’d be a unique surprise! Bill – I have your info from the last swap so I will add you to the list. Great to have you involved in this one too. John – you could make Kenny a new seat for his outhouse. I’m off to drool at the Bell Forest exotic wood blanks to see what I can find for wood for my swap item. 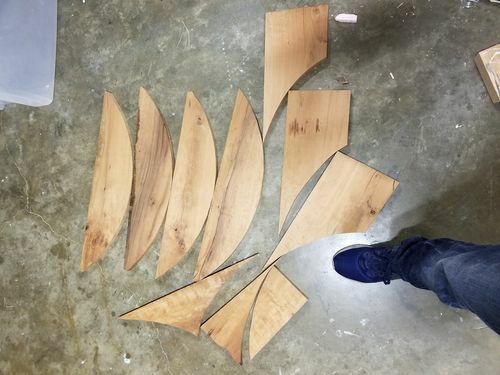 John you could use the long pieces as sides for a pizza peel, glue a longer board in between 2 of those so you end up with 14-16”width overall, shape the edges and a handle and boom you’re done. And now I need to pickup some dough, hungry for pizza! Bill, [deleted joke about being out of clubs] I have neither sealskin nor the expertise to build one of those! Earl, I’ve honestly thought about building cherry toilet seats for my home. Or make one and keep enough material to make that outhouse seat too! Rich I’m sure you can get by with only $300 in tools! If you get my name Rich, you can just send me the $400. You’re welcome. And next weekend i’m putting together a 4’ x 4’ outfeed/assembly table with t-track top, 12 drawers, shelves for my sanders and an end vise… :( I think about the only “new” tool I’ll be getting is a full size lathe as a gift to myself in July when I finish my next degree. Or maybe a domino if one pops up used for a steal. While the Comet ii does it’s job, I’m just limited to bowl sizes and stuff. I feel it’s fairly under powered also stalls out a lot when I use bigger blanks. The belt on it slips a lot too and even the head spindle is starting to slip when trying to remove chucks on it. The lock on it’s starting to go unfortunatley. Really leaning towards an 18|36 for the weight. It will be the same size as my current lathe bench that I made. Then I’ll take the Comet and turn it in to a buffing station with a 3 wheel setup. Maybe keep it for bottle stoppers. Said no Kenny ever haha! Ok I’m in, oh and done.. when are we drawing names? Gotcha Rich. Makes sense to me! Ok I m in, oh and done.. when are we drawing names? Following along for now but I may join in by the due date after I get all my xmas obligations done. I still haven’t made one of the gifts I promised from last year. Plus I bought a new 65” TV that I have to modify my current TV cabinet so it’ll fit.